The eagle has stood as a powerful symbol for hundreds and hundreds of years. As far back as the Greeks, it has symbolized courage, strength, and foresight. And now, you can harness those traits for yourself, in the Germanic Eagle Leather Bracers. These bracers feature a Germanic styling of a heraldic eagle. It features outspread wings and legs, displayed for all to see, as well as an open beak, a long neck, and a shield-shaped body, with five streaming tail-feathers. The bracer is hand-crafted from quality leather and is available in either thick, armor-grade 13/15 oz. leather or a thinner, more flexible and supple 7/8 oz. 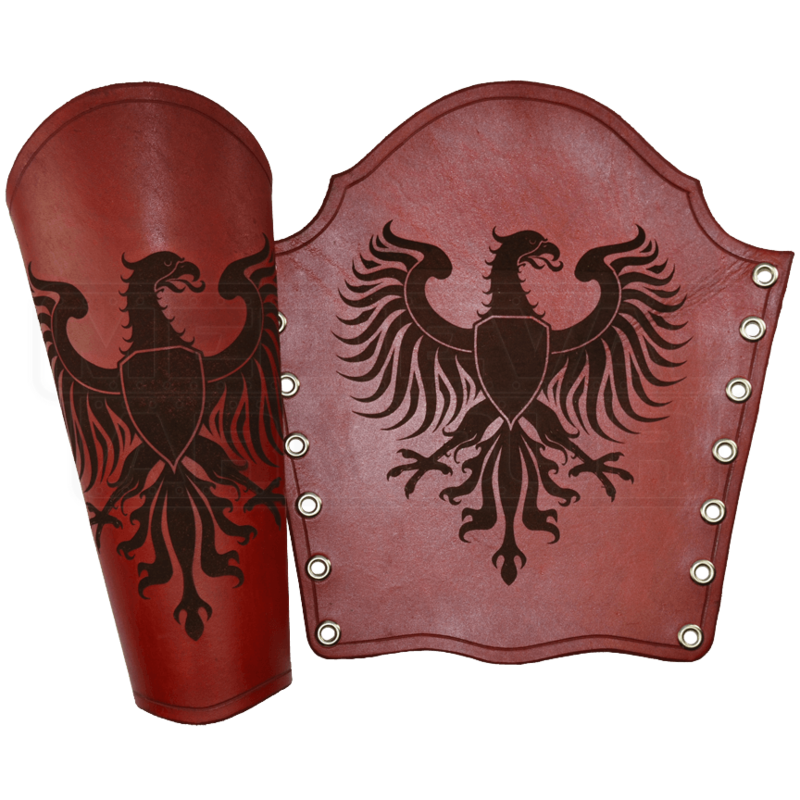 leather, and it features a Germanic eagle that has been engraved into the bracers leather, giving it a dark yet attractive burnished appearance. Along the two outside edges of the bracer are rows of eyelets. The supplied leather lace is fed through here so that they bracers can be pulled tight and worn, securely, on the forearm. Once worn, the bracers feature a wonderfully rounded shape at both top and bottom end, with the eagle prominently displayed. If you need a stylish bracer, if you favor eagles, or if you just happen to favor strength and courage, the Germanic Eagle Leather Bracers are the ideal bracers for you.